Meet the boy who can find trouble without even looking. 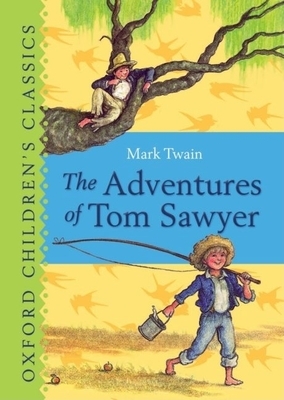 At school, at home, in church and outdoors, if there's mischief afoot, Tom Sawyer will be in the thick of it In addition to his everyday stunts and trying to impress the adored Becky Thatcher, Tom experiences a dramatic turn of events when he witnesses a murder, runs away, and returns to attend his own funeral and testify in court. A classic children's tale and one of the Common Core State Standards Initiative's selections of recommended texts. Oxford Children's Classics bring together the most unforgettable stories ever told. Complete and unabridged text allows children to discover the stories as they were meant to be read. Produced in beautifully designed hardback editions, the collection features well-loved classic stories readers will treasure and return to again and again. Mark Twain, pseudonym for Samuel Langhorne Clemens, is known by some as the 'Father of American Literature. A prolific writer and satirist in the late 19th and early 20th centuries, he is well known for his The Adventures of Huckleberry Finn, The Adventures of Tom Sawyer, and his non-fiction work. He died in 1910.